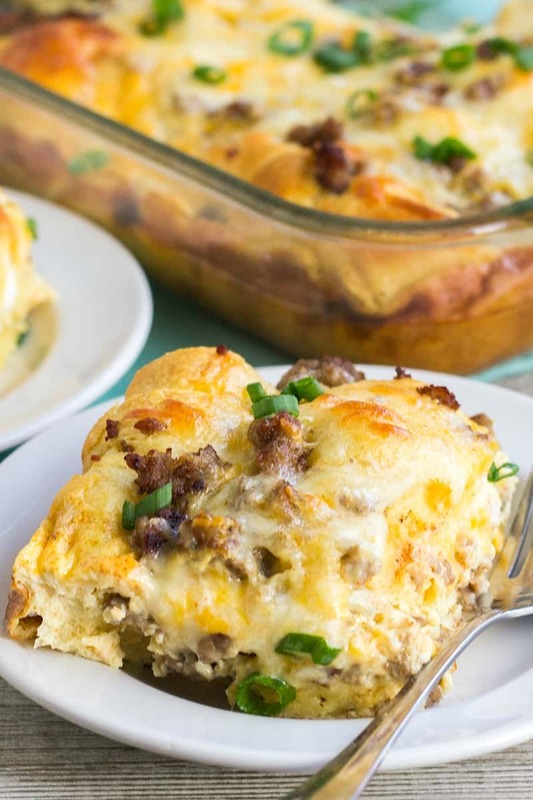 Cheesy Sausage Crescent Roll Breakfast Casserole is a filling breakfast that’s great for a crowd! 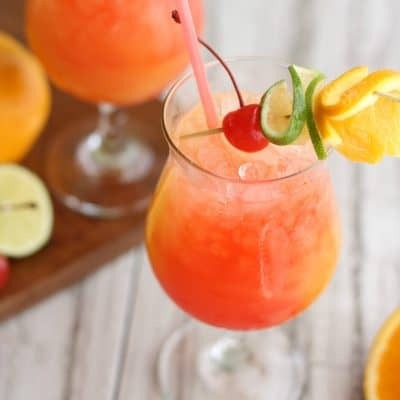 It makes a wonderful brunch bite that everyone will love! Breakfast casseroles are one of my favorite food inventions! It’s a big pan full of eggs, meats, cheese, and bread which basically equates to the perfect bite at my house. You can mix and match your casserole with your favorite ingredient combinations and then let the magic happen. 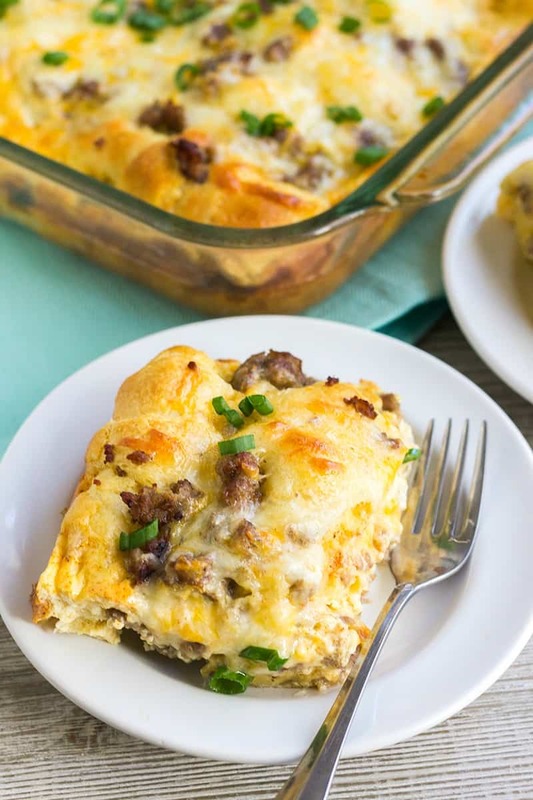 And this Cheesy Sausage Crescent Roll Breakfast Casserole is pretty magical. This recipe was a huge with my family for Christmas breakfast and I can’t wait to make it again! I think my favorite thing about this breakfast casserole is the crescent rolls. Who doesn’t love those buttery, flaky rolls?! 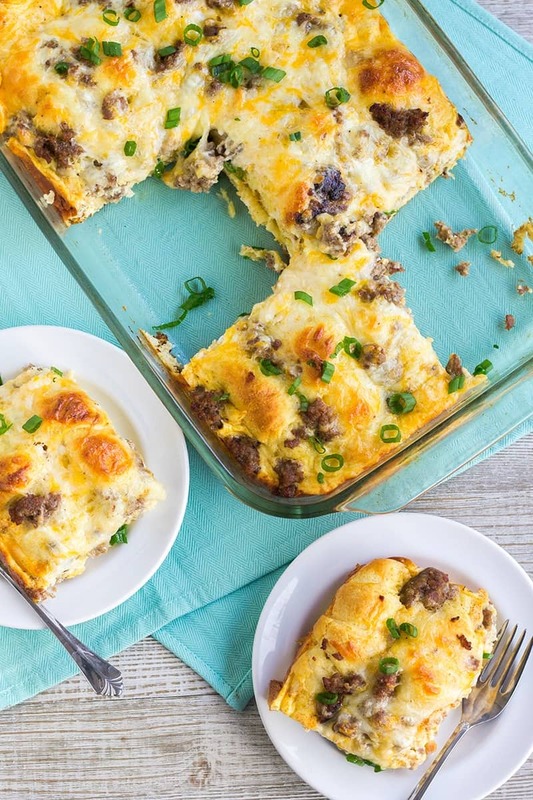 They are a great conduit for the eggs, cheese, and breakfast sausage in this casserole, and they help fill you up so everyone is left feeling satisfied. This breakfast casserole recipe is pretty easy to make. Just cook up the breakfast sausage, roll the crescent roll dough, layer everything in the pan and bake. Then you’re free to grab a cup of coffee and snuggle on the couch until breakfast is ready! I like to top this crescent roll breakfast casserole with some green onions for some color and fresh flavor to finish things off. You could even add a little red bell pepper if you like, but the onions were enough for me. Serve up this breakfast bake at your next brunch and watch how quickly everyone devours it! 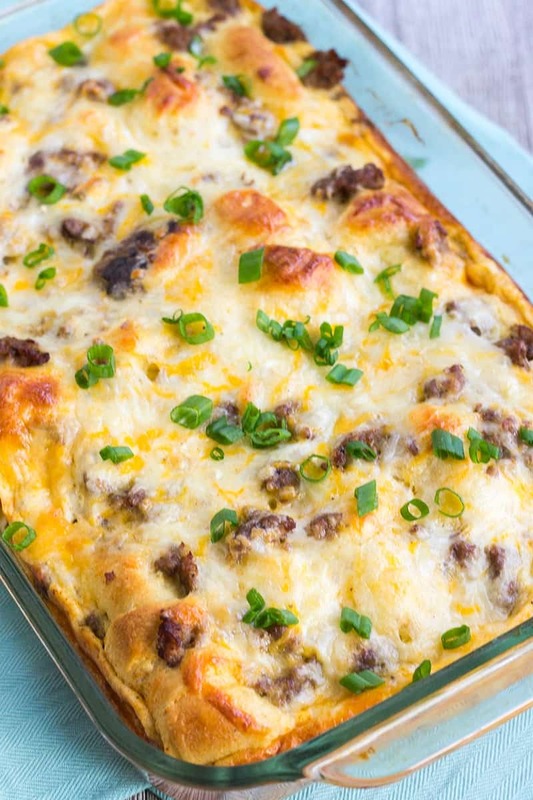 Cheesy Sausage Crescent Roll Breakfast Casserole is a filling breakfast that's great for a crowd! 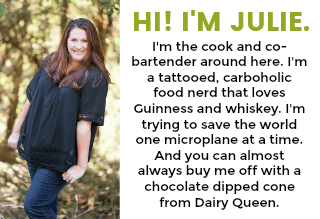 It makes a wonderful brunch bite that everyone will love! Open crescent rolls and roll according to package directions. Arrange 15 rolls in the prepared baking dish in three rows with 5 rolls in each row. Add sausage to the baking dish, spreading it evenly over the rolls. Pour the egg mixture over the rolls and sausage. 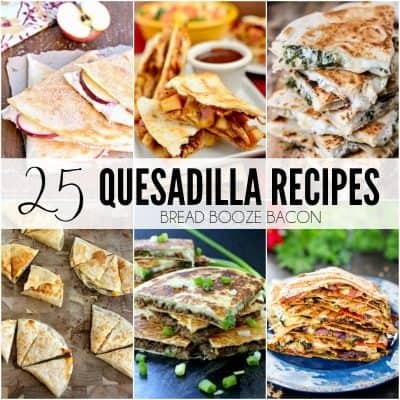 Spread the cheese evenly over the other ingredients. Bake for 25 minutes. Carefully remove from the oven. Allow to sit for 5 minutes. Sprinkle top with green onions, if desired. Serve warm.